It’s been two weeks since I blogged, but it feels like months. Funny how time does that to you – some days or weeks or months feel incredibly long and others fly by faster then you can blink. FLS from start to finish! 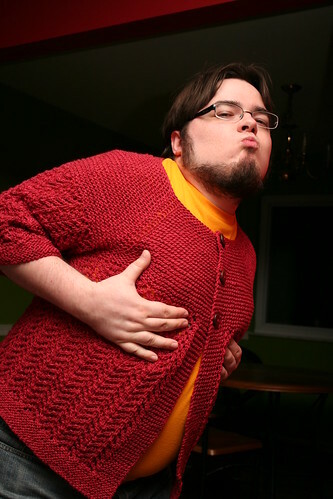 Matt was kind enough to be my model last night. This one is definitely my favorite! Notes: The only thing I changed was the YO’s in the yoke. I left them out because somehow my stitch count got screwed up twice, so instead of the YO increases, I just did knit front and back increases to get to the stitch count I needed. I love how this turned out and have a feeling that I’ll be wearing it a lot! 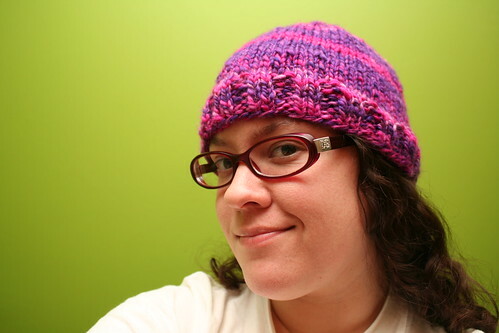 About halfway through this sweater, I decided to cast on a hat as a portable project (and because I needed a warm hat for the snow and cold weather). Turns out it went a lot faster then I expected and I had it done within a day. I like how it turned out and it keeps my head nice and warm. Notes: I made up my own pattern for this after not being able to find a free one I wanted. My head is about 21.5 inches around, so this should fit most adults. Cast on 72 stitches, worked in k2, p2 rib for 6 rounds, then in stockinette until it measured 5 inches from the cast on edge. 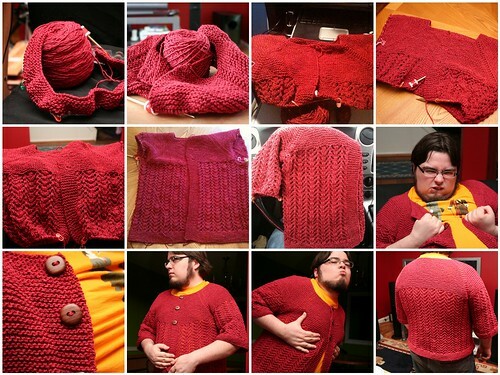 For the decreases, knit 12, k2tog, repeat around (there will be two “leftover” sts). Every round after knit 1 stitch less, k2tog (ie next round k11, k2tog), until you are down to k2, k2tog for the last round. Break yarn and thread through remaining stitches to close. 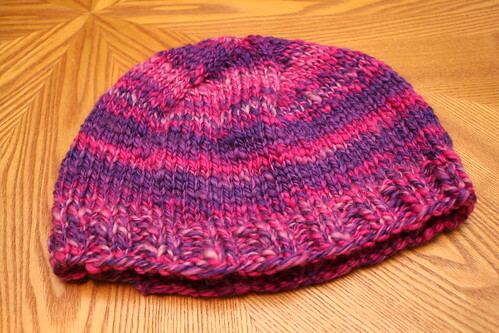 Pretty simple hat. Next time I’d probably cast on 68 stitches, then increase to 70 the first round of stockinette. I decided last minute that I’d try to get in an Ravelympic spinning project, but I’m not sure it’s going to get done by Saturday. 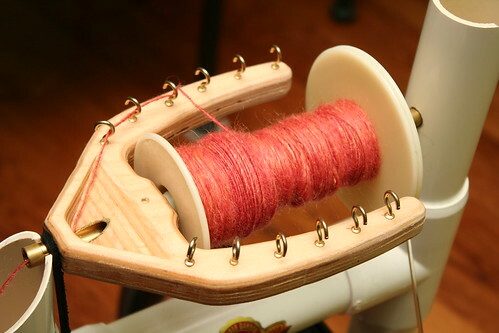 It’s been slow going because my hip and lower back have been giving me some grief (along with my knees each time I spin! 😦 ), so I haven’t got very far. We’ll see how much I get done this weekend. It’s for the Spin-and-Knit-a-Long over on the Zarzuela’s Fiber Junkies group on Ravelry. The SAL/KAL goes until May 1st and the deadline for spinning is April 1st, so at least I still have time to get it done for that! I’m loving spinning this up – it’s very nice to work with. It’s a merino, silk, mohair blend and I like the colors. Spinning from a batt has taken some getting used to, but I think I’ve got it all figured out now. Since the Olympics (and thus the Ravelympics) are almost over, it’s time to get back to my “regular” knitting. I’ve now picked up Matt’s socks again and should have them finished this weekend. I’ve already turned the heel on sock number two and the leg should go pretty quickly. Now… what to knit next? Fantastic stuff! Great photos. You and your man make a cute couple, btw.